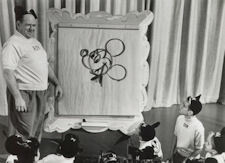 The table below contains all known Anything Can Happen Day programs shown during the first season of the original Mickey Mouse Club, by order of broadcast. If you find that your favorite episode doesn't appear here, it might have been on Fun With Music Day. 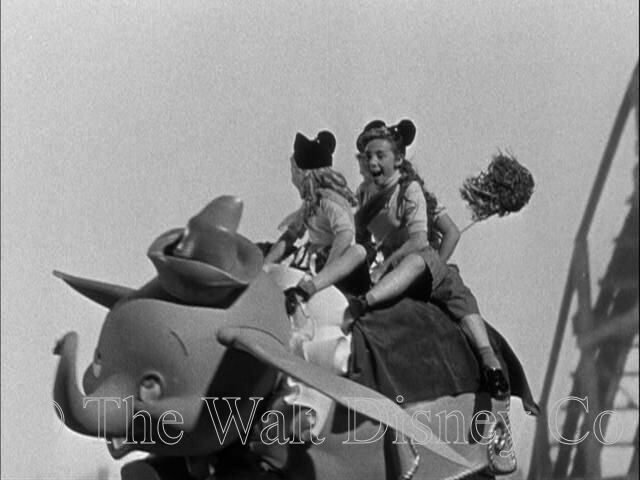 These programs leaned heavily towards promotion of rides at Disneyland. 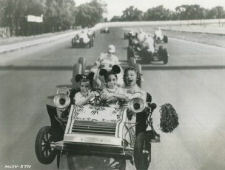 Their entertainment value was limited and consequently few have been preserved by collectors or featured in official Disney VHS or DVD collections. 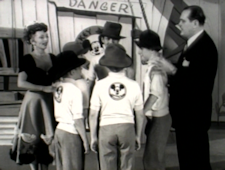 Storyline credits are assumed to be Bill Walsh, Hal Adelquist, and Roy Williams. The few song credits are listed in parantheses. 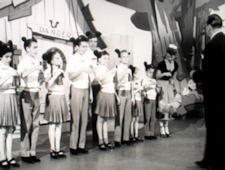 Where available, images have been provided from the actual show, but for many of these programs there is no picture available. Only original broadcast appearences are listed; reruns are excluded. Note that some credits or photos might be incorrectly assigned to a particular show. While all shows are listed, the credits for them are incomplete. Most of the information below was extracted from original research done by Bill Cotter, however, any errors of fact or mistakes in interpretation are my own. Jimmie shows the kids how common objects can be made into musical instruments. Bob Amsberry does an overly long comic soliloquy as a park cleaner in paradise to a Hawaiian tune from the band. Jimmie, Karen, and Johnny sing the title song, then Jimmie explains the game. 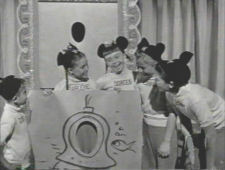 A Mouseketeer tries to guess what Roy drew while five others give hints. Bob provides on-camera sound effects. No information or photos available for this. Tamer version of 'What Am I?'. No ad-libbing so the kid's personalities don't stand out like in the former game. 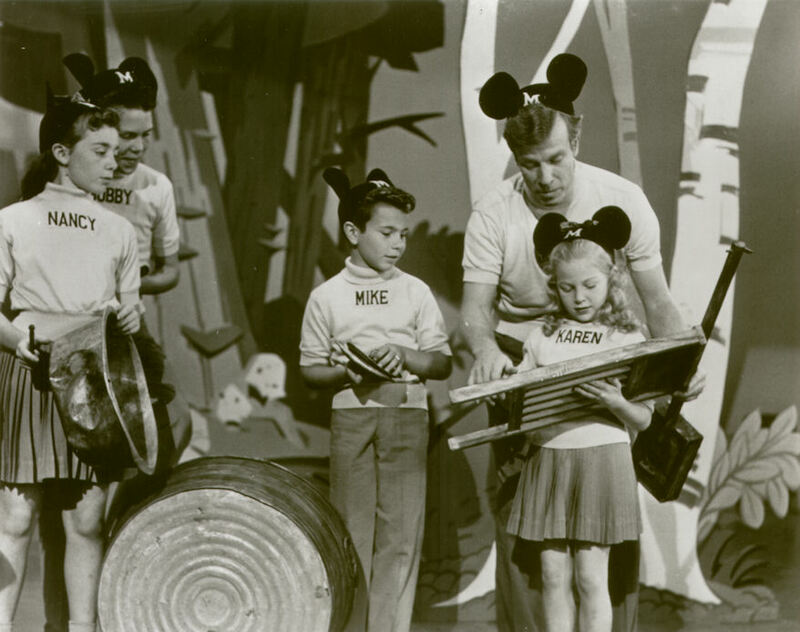 Jimmie and the kids give clues, then Roy draws the answer while the mice sing Roy, Roy, Quick on the Draw. 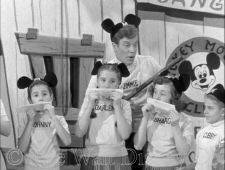 Uses sight gag of Jimmie appearing on both ends as the camera pans along the Mouseketeer line-up. 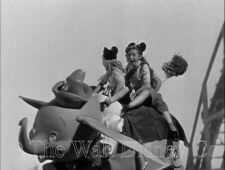 The photos here are from the ACH Day opening; its unknown which of the two Dumbo ride shows they represent. 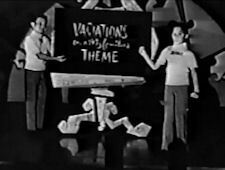 The first of a series of Disneyland ride promotion skits. 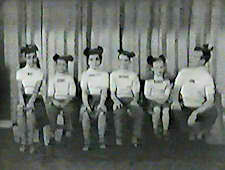 These took the form of two groups of three Mouseketeers riding for several minutes, with short dialogue breaks before and between excursions. 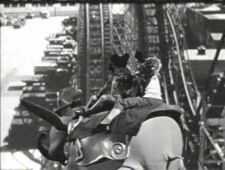 The rides were stationary props on a sound stage that could be rotated and tilted by off-camera stagehands. A back-projection film of stock footage was used to provide a sense of movement. 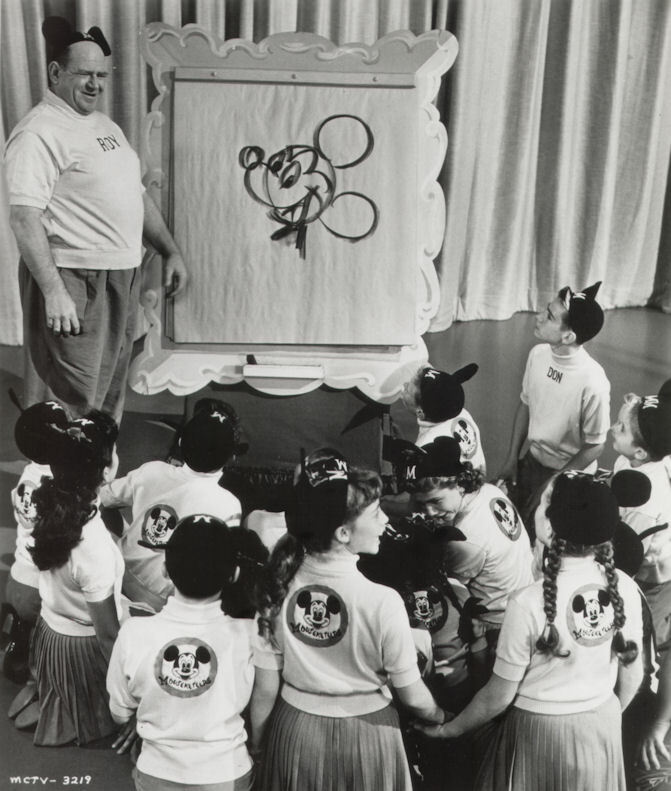 Roy shows the kids how to draw Disney characters. Patterned after the live demonstrations Roy did at local schools for several years before the show started. 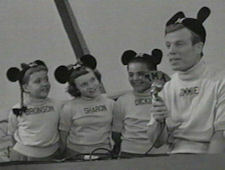 Roy had also suggested a short series on animation for the Disneyland television show, which was later turned into Karen in Kartoonland with Bill Justice. This was a crossover from Guest Star Day, with vaudeville/nightclub comedian Lionel Kaye (1901-87) and his wife Kathleen. For the first half seven mice do Suwanne River on bells. 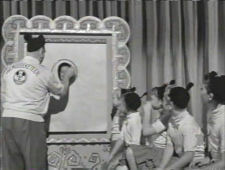 The second half had Bobby, Lonnie, Don, Mark, and Dennis exchanging hats upon command, a staple gag of the Kaye's live act. Lionel Kaye was the unsung hero of the 1939 Palomar Ballroom fire in Los Angeles, calmly directing the audience to leave by the side exits and urging them not to rush even as the stage behind him burned. 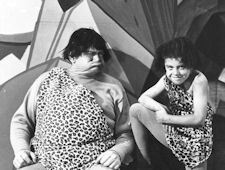 Les Philmer and his wife Mary were veterans of the 1930's vaudeville and international music hall circuits who did a juggling and balancing act. Anything Can Happen Day shows would occasionally contain material originally devised for other days of the week. 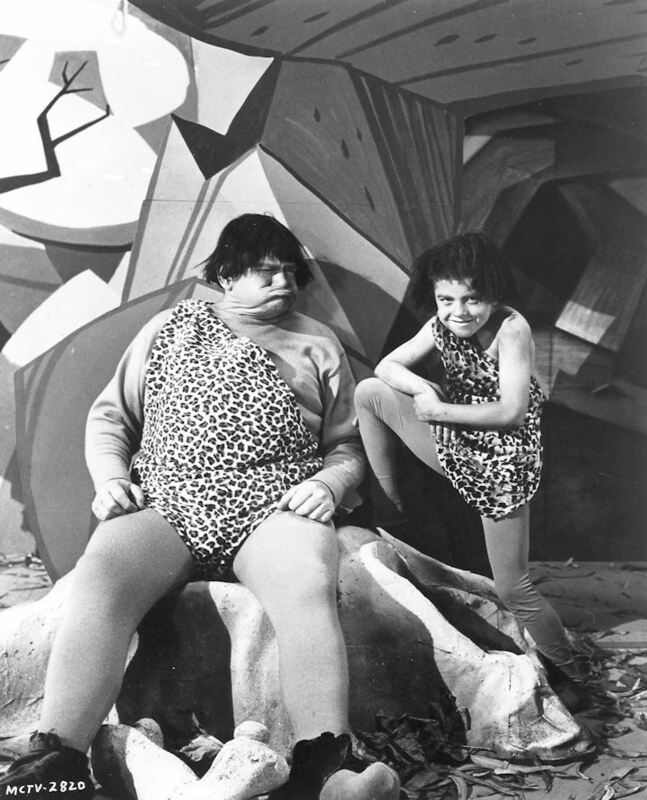 This program was likely meant to be a Circus Day show. 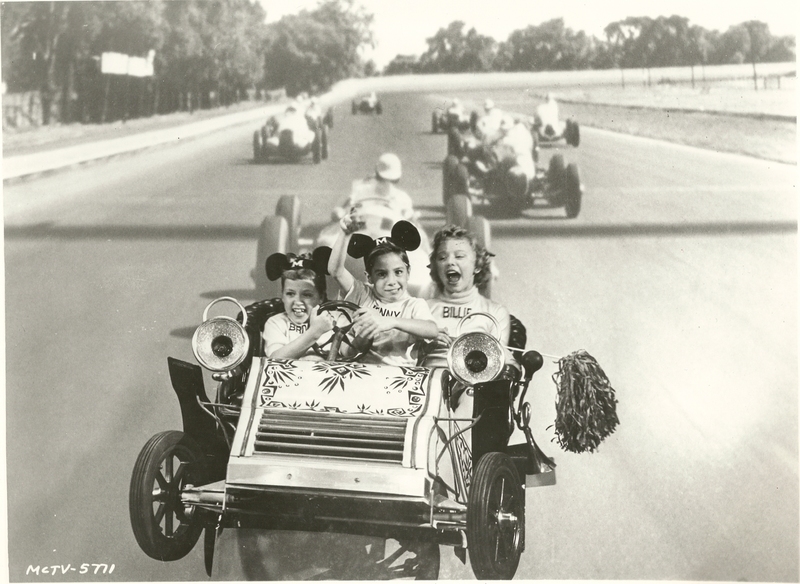 Another in the series of Disneyland ride promotion skits. No information available. Shared a day with What Am I? #2 (below). 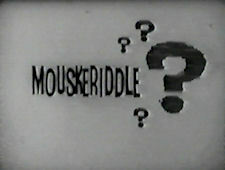 Given the short time alloted (four minutes) the introductary song used in the first skit of this type was cut. The Blue Team mice play only two rounds of the game, then it shifts without explanation to the Red Team for a very quick final round. Shared a day with Gadget Tree (above). Randall Nakashima's detailed storyline for what he describes as a live-action Goofy cartoon can be found here. 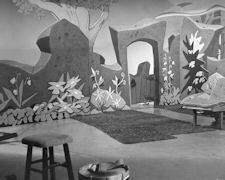 The gap in time from the previous show was due to reruns during the first weeks of January 1956. 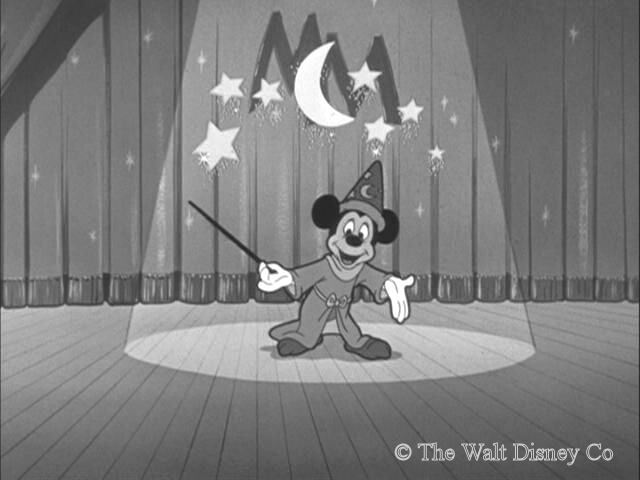 This was actually planned as a Fun with Music Day show, as shown by the production number. 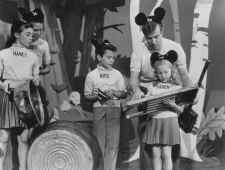 The live studio orchestra plays variations on the theme song, each style being interpreted in dance by two Mouseketeers. Sharon & Nancy are '20s flappers, Karen & Cubby do a minuet, Sharon & Don glide thru a comic tango, Lonnie & Annette give us the old soft shoe, Darlene & Doreen are en pointe, while Bonni & Bobby first perform a swing-tap routine then finish with a Lindy Hop. Another in the series of Disneyland ride promotion skits. Judy was the air hostess for Flying Toad Airlines, Lee and Tommy the mechanics. 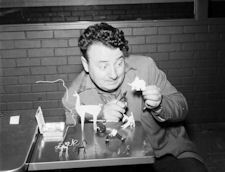 Joe Baggi was a "sculptor" whose preferred medium was pipecleaners and other mundane materials. No further information on this. Anything Can Happen Day shows would occasionally contain material originally devised for other days of the week. This program was obviously meant to be a Guest Star Day show. 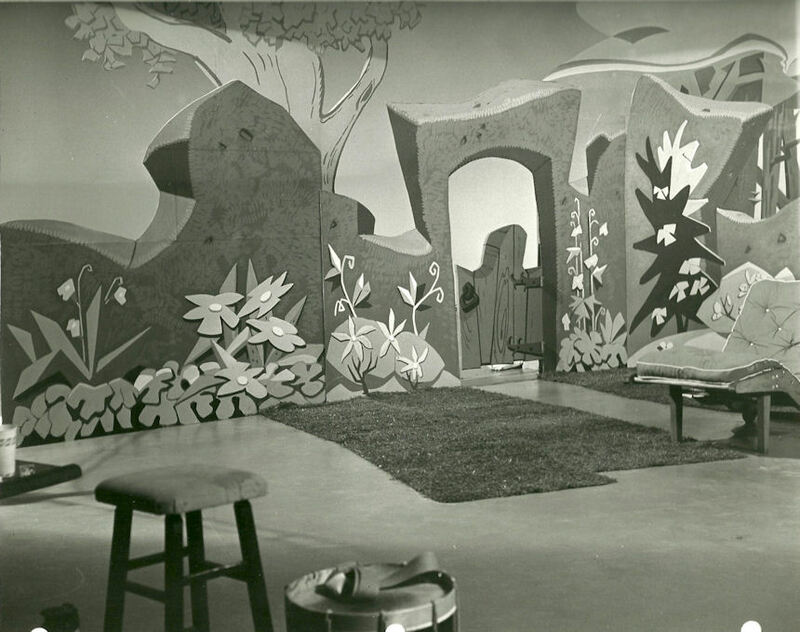 This was the last original broadcast ACH day for the first season.